Things to consider when purchasing insurance for your boat in VT.
Boat insurance gives you the financial ability to repair or replace your boat should the need arise due to accident, vandalism or theft. Most insurance companies divide boat insurance in two categories, small boats measuring less than 29’ in length and large boats longer than 29’. Many of the major insurance agencies have offices throughout Vermont or offer online rate quotes and policy acquisition for boating insurance. Because boat insurance rates vary between agencies, it is always wise to request a rate quote from more than one. To compare apples to apples, each quotation should include equal provisions for the type of coverage, who is covered, coverage amounts, limits and deductibles. Check each quotation very carefully. Make sure the policy includes all your boat accessories, such as the trailer, safety equipment, and all boat motors. Coverage and rates also vary depending on the length and horsepower of the boat. Boat insurance agents have offices in most major cities in Vermont. If you have difficulty locating an agent which offers boat policies, ask a local boat dealer for a referral. We list boat dealers by city, including cities such as Shelburne, Vergennes, Barre, Montpelier, Newport, Brandon, Rutland, Hartford, Springfield, Wilmington, Burlington, St Albans, Waterbury, Lyndonville, Morrisville, Bennington, Fair Haven, Wells, Randolph and West Brattleboro. Most boat dealers are familiar with local boat insurance providers. If you are injured in a boating accident, due to negligence of another party, it may be beneficial to contact a Vermont personal injury attorney before meeting with the other party's insurance representative. The Vermont Bar Association may be of assistance. Boat and boating insurance policies. Generally, anyone can operate the boat under a small boat insurance policy, however one should read your policy carefully for any exceptions. It is recommended the amount of insurance should be at “agreed value” which is equal to replacement cost of the boat and covered accessories. Not all policies are identical so have your agent explain the policy and any special requirements in Vermont. Ensure your valuable boat is covered for flood, fire, and accidental damage by investing in a sound boat insurance policy. Speak with your Vermont boat insurance agent for specifics and limitations. 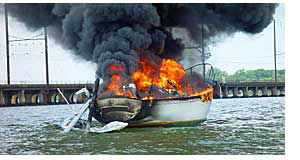 Boat insurance is a serious matter. We recommend you use the above information as general in nature. It is in no way intended to represent specific details for insurance decisions. Do your own due diligence before acquiring boat insurance from any provider in Vermont as well as from boat insurance providers online or outside the state. Insurance agents in other states.